Up there. Go strait, ‘n take a right at da “Sigma” sign. 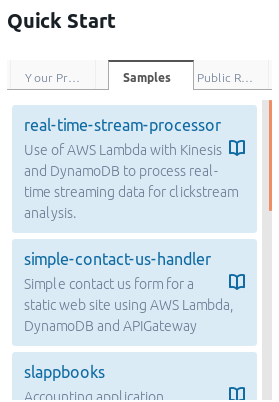 One of our dream goals was that working with Sigma should be a no-brainer, even for a complete stranger to AWS. However, in the (very likely) event that it is not so yet, here is a short guide on how you can get the wheels turning. an internet connection; since you are reading this, that’s probably already ticked off! a GitHub account; again, free to sign up if you don’t have one already! 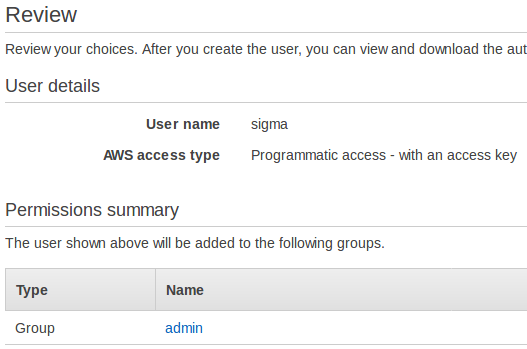 Before firing up Sigma, you need to gather or create some access credentials for allowing Sigma to access your AWS account. Sigma will do a lot on your behalf, including building and deploying your app into your AWS account, so for the moment we need full admin access to your account (we are planning on preparing a minimal set of permissions, so you can sleep well at night). 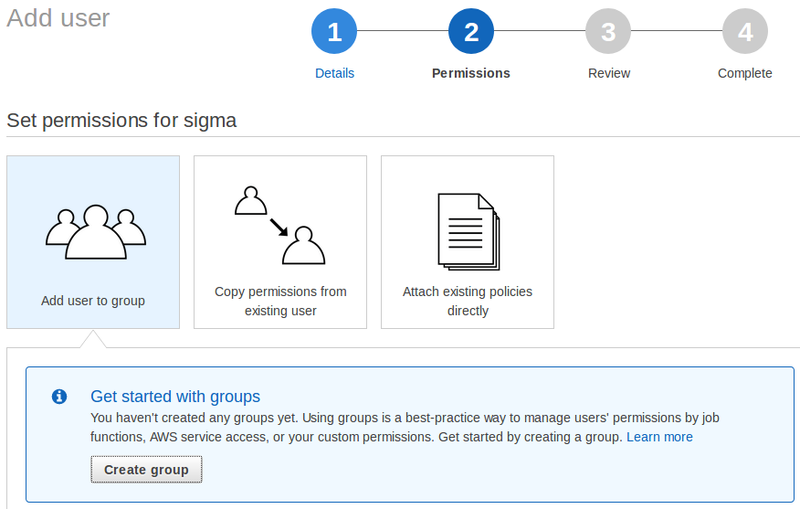 Here you will allow Sigma to act as your AWS root user for gaining the required access. Although Sigma promises that it will never share your credentials with other parties (and store them, only if you ask to do so, with full encryption), using root user credentials is generally against the AWS IAM best practices. Copy both of the above values to a secure location (or click Download Key File to save them to your filesystem). Combined, they can do anything against anything in your AWS account: the two keys to rule them all. Under Access type, tick Programmatic access, and click Next: Permissions at the bottom right. (Tip: you can get to this point right away, using this shortcut URL. The pop-up will close, and the brand new group will appear in the groups list of the permissions page, already selected (ticked off) for you. Double-check that your user has a nice name, and that it belongs to the new group you just created. If all looks fine, click Create user. Once the user is created, you will be shown a Success page with a table containing the Access Key ID and Secret Access Key (masked with * s) of the user. Here’s the official, detailed version. Once you follow either of the above methods (and have an access key-secret key pair in hand), that’s it! You’d no longer need to wander around on the AWS dashboards, as Sigma will handle it all for you. Click the “Create an account” link against the “New to Sigma?” message. Fill in your first and last names, email, and phone number (if it’s okay with you). Take note of your username: we’ll automatically generate one, using your first and last names. If you don’t like our taste, you can always type in your own crazy one (as long as another user has not used it already). Choose a password. We are a bit peculiar about our passwords, so they need to be at least 8 letters long and have at least one from each of the letter categories: uppercase, lowercase, numeric and symbolic (@, $, # etc.). You can press and hold the "show password" button (eye icon) to confirm what you have typed. When all looks good, click Sign Up. If we are happy with the info you provided, we’ll take you to a confirmation page (Insert Confirmation Code). We’ll also send an email to the address you indicated (from noreply@slappforge.com), with a verification code. Check your mailbox for our email (including promotions, spam, trash etc. in case it does not show up in the inbox). Once you find it, copy the 6-digit confirmation code in the email, paste it into the confirmation page, and click Confirm. If all goes well, we’ll show you a “Confirmation successful!” message, with a link back to the sign-in page. Go to the sign-in page, and log in using your username (that you took note previously, on the signup page) and password. Way to go! Just two more steps! 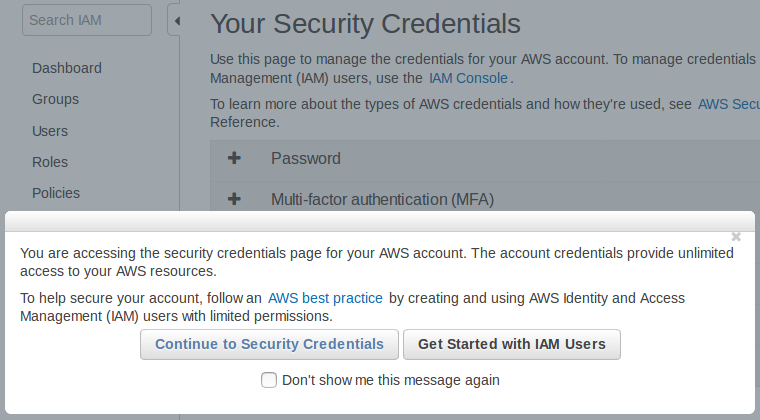 After sign-in, you’ll be in an AWS Credentials page. Now, dig up the “access key ID” and “secret access key” that you retrieved from the AWS console previously, and paste them in the Access Key ID and Secret Key fields, respectively. If you are a bit too skeptical, you can avoid the storing option by unticking the Save Credentials tick box. 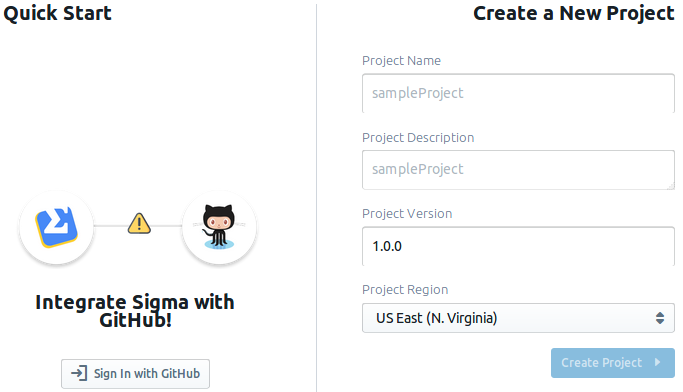 Now you will be in the projects page, with a quickstart pane (saying Integrate Sigma with GitHub!) on the left. The pop-up asks you to authorize the Sigma GitHub app (made by us, slappforge) to connect with yOnour GitHub account. Click the Authorize slappforge button to continue. Once done, the pop-up will close, and the quickstart pane will start displaying a bunch of ready-made Sigma projects! If you have the GitHub URL of any other Sigma project that you know of, just paste it in the search bar of the Public Repositories tab and hit the search button. Once you have the project that you were looking for, simply click to load it! Here comes the Sigma editor, loaded with the project you picked, and ready for action! Originally published at randomizd.blogspot.com on February 20, 2018. Dev|Hacker @ SLAppForge (https://slappforge.com/) & AdroitLogic. Issue hunter. Nationalist. Loves Firefox, Linux, cats, tea, and… music!